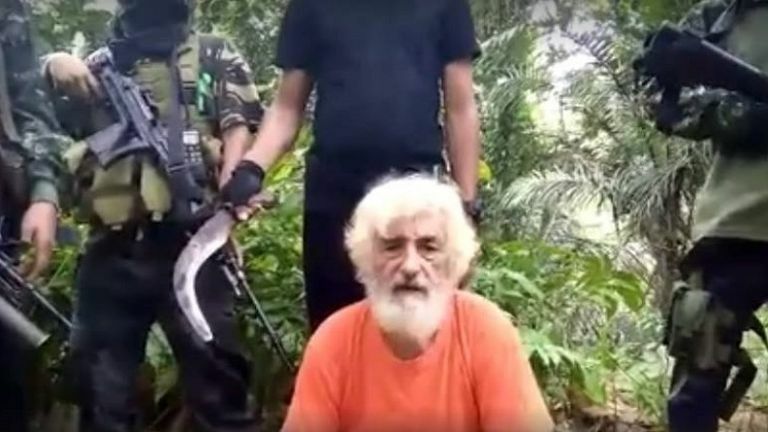 The Philippines and Germany condemned on Monday the beheading of an elderly German captive by Islamic State-linked Abu Sayyaf militants who posted a video of the killing after a deadline for a US$600,000 ransom passed. The video showed a machete-wielding militant behead Jurgen Kantner. The German had appealed for help twice in short video messages, saying he would be killed if ransom were not paid. Jesus Dureza, presidential adviser on the Philippine peace process, said officials had exhausted all efforts to save Kantner, 70, who was held on the tiny southern island of Jolo. He made no mention of the ransom demand. The Philippines’ armed forces pledged in a separate statement to bring Kantner’s killers to justice and to continue operations to free other hostages held by Abu Sayyaf. In Berlin, Chancellor Angela Merkel called for a united international front against terrorism. Last year Abu Sayyaf decapitated two Canadians on Jolo but later freed their two companions, a Filipino woman and a Norwegian. The four had been seized from a tourist resort. The ransom demand for the Canadians was 6.4 million U.S. dollars each. Abu Sayyaf’s activities in recent years have been mainly banditry, but the Philippines believes Islamic State has been in contact with members of the group’s leadership with a view to gaining a foothold in Southeast Asia. Abu Sayyaf, which means “bearer of the sword”, has capitalised on decades of instability in the southern Philippines and generated tens of millions of dollars from piracy and ransom payments. It uses the money to buy arms, high-powered boats and modern navigation equipment, allowing it to avoid detection and seize crew of slow-moving vessels with ease. 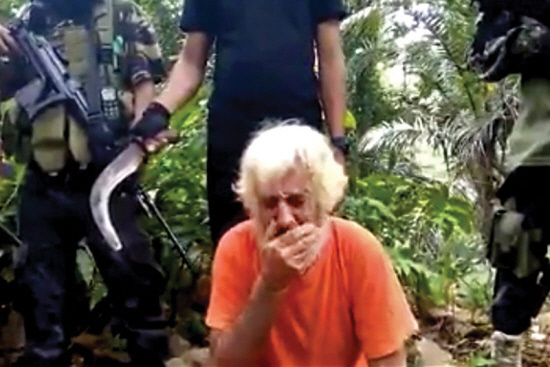 Kantner and his companion were taken captive in November while sailing on a 53-footer yacht near Sabah, eastern Malaysia, and brought to Jolo. His companion was shot dead when she tried to resist the militants. Reports of Kantner’s execution emerged on Sunday evening, but the military only confirmed the killing on Monday, citing “reliable sources”. It said it would continue to search for Kantner’s remains in order to hand them over to his family. Abu Sayyaf is currently holding 26 hostages – 13 Vietnamese, seven Filipinos, a Dutch national, a Japanese, two Indonesians and two Malaysians, the military says. Experts say the group is very unlikely to free any hostages without payment. Speaking on the sidelines of the U.N. Human Rights Council in Geneva, Philippines Foreign Secretary Perfecto Yasay said Manila was seeking technological help from allies to pinpoint the hostages’ location. The Philippines has deployed thousands of troops in the Abu Sayyaf strongholds of Basilan, Tawi-Tawi and Jolo islands, yet despite air and ground offensives, the group’s piracy and kidnappings continue unabated. The rebels are entrenched in local communities, complicating operations by a military that is wary of incurring civilian casualties. They Put Crackers On A Baking Sheet – When It Came Out Of The Oven, I Was Drooling!